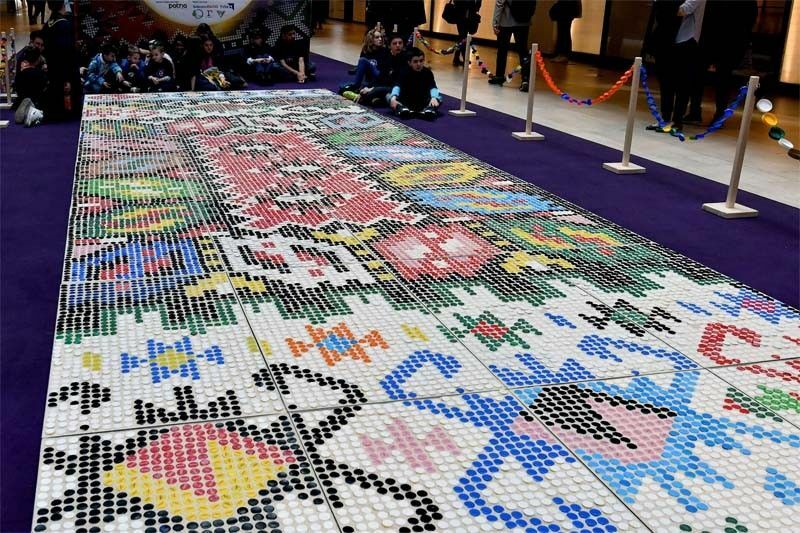 "Bosnian qillim" carpet made of plastic bottle caps in colors and patterns typical for Bosnian traditional wool carpet is displayed at Sarajevo City Center mall to mark the International day of recycling, on March 18, 2019. SARAJEVO, Bosnia and Herzegovina — A carpet in the form of a traditional Bosnian rug made up of 25 thousand plastic bottle caps goes on display in Sarajevo for World Recycling Day. "Bosnian qillim" carpet made of plastic bottle caps in colors and patterns typical for Bosnian traditional wool carpet is displayed at Sarajevo City Center mall to mark the International Day of Recycling last Monday. Bottle cap carpet was made by 700 citizens of Sarajevo, it covers 30 square meters of surface and was made using a total of 25,000 plastic bottle caps.